You are here: Home / Money / Business / American Descendants of Slavery (ADOS) Fight for Reparations. No more shall the dark practice their deception and proliferate the world with their deception and lies. It is time for the full truth to come out, and eventually only the truth will exist. ADOS true historical links with the past will be made known, and of it there will be no doubt…as it all exists in the Now. ADOS movement represents a strong push for respect and reparations…rightfully so. Indeed, reparations are long overdue. All other groups have received reparations for past wrong doings. Jews, Native Americans, Japanese, Filipinos, etc. have all been compensated, but ironically enough ADOS have yet to receive reparations for the 300-year African-American Holocaust (dwindling to an end during the 1960s), 100 years later after the signing of the Emancipation Proclamation. During the 300-year AA Holocaust millions of…men, women, AND children…were ostracized, terrorized, beaten, mutilated, disemboweled, lynched, raped, boiled and burned alive, castrated and murdered. Consequently, all the wealth and power in this country have been dispensed over 400 years systemically into the hands of the white society. African-Americans don’t own a significant amount of anything to be able to control their lives; America’s majority control almost 100% of the income, wealth, power, the resources, privileges and all levels of government…making it impossible for ADOS as a group to compete. Grim reality: Symptoms of pathological issues in the black community such as drug related crimes, fatherless homes, unwed teen-age parents, welfare, poverty, black on black crime, etc. are laid directly at the doorsteps of the black community to shoulder the blame; but what’s never addressed is the CAUSE of these symptoms. The grim reality is that the black community have been locked into a NO WIN situation. Without question if any group is entitled to reparations it is the ADOS. However, there is another painful truth which needs to be addressed. All other groups, Jews, Native Americans, Asians, etc., revere, honor and demonstrate respect for their ancestors. They understand their ancestors were human and had the same emotions they now have. They understand there is no separation between body, mind and spirit and that…respect for their ancestors…is respect for themselves. ADOS are remiss of this understanding. They fail to understand or appreciate the sacrifices our ancestors made, and the opportunities made available to us as a result of those…sacrifices and struggles. ADOS are the ONLY group in the entire world who aggressively use oppressor-created labels of hatred and marginalization as “terms of endearment” when other groups eschew similar labels. Embrace of the N-word trivializes, disrespects and curses the hallow memories, struggles and sacrifices of our ancestors. The blood of our ancestors cries out in anguish…but their voices are muted…by callous, self-centered, non-caring, ungrateful descendants. Usage trivializes the suffering of those who came before us and built this country with no pay, no credit…not even a thanks or apology. Self-internalization of the N-word excuses modern day social injustice and the dehumanization of racism; embracing it grants police brutality tacit approval, gives a nod to those who say that racism doesn’t exist and allows it to perpetuate, sanctioning any and all atrocities administered to our ascendants during the Holocaust. It begs the question, what is the TRUE motivating factor, behind ADOS claiming the most profane, ungodly, immoral, racist term in the English language, the N-word, as a so-called “term of endearment?” A term that brought fear, terror, horror, bloodshed and carnage into the lives of our ancestors. Mental enslavement is the answer! American slave-masters paid a great deal of attention to the education and training of the ideal slave, these draconian methods weren’t administered to slaves anywhere else in the Americas. In general, there were five steps in molding the character of American slaves: strict discipline, a sense of his supposedly own inferiority, belief in the master’s supposedly superior power, acceptance of the master’s standards, and, finally, a deep sense of his own helplessness and dependency which meant a new self-image had to be created. At every point this education was built on the belief in white superiority and black inferiority. This was and is the psychological purpose of browbeating our ancestors into submission…to use and accept usage…of the N-word. Though today viewed simply as a racial slur, it’s intent and purpose is far more noxious and sinister, it serves as a self-refueling, self-generating psychological conduit to…mental enslavement. To assume otherwise will prove to be a gross error in judgement. ADOS ascendants were stripped of their identity, given a new name, and a new image to envision him/herself, and their African heritage as inferior and barbaric. Slave- masters insisted on total obedience and created a situation of utter dependency, this methodology of mind control created infantile and self-hatred characteristics branding the negative image of the N-word into the heart, mind and soul of a race of people to last for centuries to come. Today not all African-Americans use the pejorative term, nonetheless, far too many do. And those who don’t many of them deal with the impropriety usage of the N-word by looking the other way, feigning ignorance. When ADOS support rappers and entertainers that humiliate and degrade their own race, in essence, that individual is participating in cultural genocide. That supporter is contributing to the emotional, psychological, spiritual, and cultural extermination of the Black race. These mentally, emotionally, misguided scarred descendants of slavery are so severely psychologically disturbed they assume that they can change the context of history, the 400-year history behind the N-word is immutable. Albeit, man can change the definition of a word on a whim, he cannot change…the history…behind the word. If by chance someone has the ability by some sort of miracle to obliterate the wrongs done against our ancestors all in the name of the N-word, restore life to those dehumanized, murdered, butchered, slaughtered, honor to the dishonored, property to those who have been wronged and force the scales of human and divine justice to recover their equilibrium then and ONLY then perhaps the N-word can be embraced and used endearingly. Unless such a task can be accomplished the N-word will eternally remain to be an immoral obscenity no matter whose mouth it flows from and their so-called intentions. For the America systemic to maintain itself it is a political necessity that black people continually prove to be out of their minds. 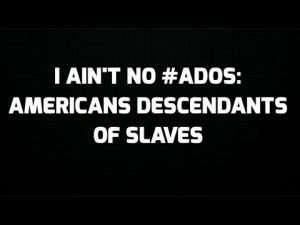 ADOS personality, behavior, lexicon, were shaped exclusively by the unique form of American slavery. To maintain status quo, contemporary MSM, music and motion picture industries, political parties, etc., all serve as agent provocateurs. Nonetheless, hope springs eternal as a small percentage of us have managed to maintain some sense of individuality, mental and intestinal fortitude escaping the clutches of mental enslavement to the N-word. The oppressor greatest fear is that some day we as a group will be able to galvanize and mobilize our energy to overcome. The 60s Civil Rights Movement gave them quite a scare, but we have since retrogressed. Physical and mental enslavement…of the two…mental enslavement is the worst form of slavery because the chains are invisible. Though physical chains were removed, mental chains remain intact. The American academia system provide nominal knowledge about physical enslavement…America’s darkest moment in time…but conclusively ignore the dehumanizing and mental terrorism process employed during slavery and make no mentioning of an African-American Holocaust. If you aren’t aware of a problem there’ll be no conscious attempt to try and overcome. Such a dilemma benefits the oppressor and is an impediment to those victimized. Should ADOS refuse to denounce usage of the N-word…they by default would be accepting the total description of it…sanctioning the evil deeds and carnage perpetrated upon our race…past, present and future. Therefore, demanding respect and reparations while simultaneously disrespecting and undermining their OWN ancestors…anathematizing them by tolerating use of the immoral N-word…the entire process becomes sanctimonious wreaking of hypocrisy, making it a farce and a sham; for should reparations ever be granted under such circumstances…it would be…nefarious blood money. Oh please. While I do see crooked America giving money to other countries, to the native Americans, Israel etc, I have yet to see the African-American community unified on a plan of logistics regarding reparations. Plus we were not slaves so why should we be paid now? How much? When? Why us? And I would venture to say most “black” people do not know their heritage beyond Grandmama. Stop looking for a handout and make things happen for you today.